Well, I don’t think I could ever get tired of banana bread. But if you’re looking to try something a little different with those overripe bananas sitting in your fruit basket, how about a banana roll? Banana sponge cake spread with a thick cream cheese filling rolled up into one yummy package — what’s not to love? 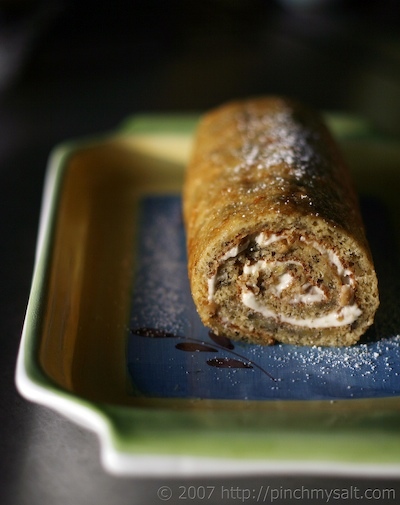 You’ve had pumpkin roll before, haven’t you? This is the same thing, except made with banana sponge cake rather than pumpkin. In fact, I just used the recipe for pumpkin roll, substituted banana for the pumpkin, took out the spices, and voila! It was one of those experiments that could have been a total disaster but just happened to turn out very well. If you’ve been reading Pinch My Salt long, you know that most of my ‘original recipes’ are created this way! 1. Preheat oven to 375°F. Grease 15×10 inch jelly-roll pan (also known as half sheet pan); line with parchment or waxed paper. Grease and flour paper; set aside. Spread out a clean, thin dish towel on the counter (make sure the towel is larger than your jelly roll pan); sprinkle liberally with powdered sugar (this can be done using a mesh strainer). 2. In a small bowl, whisk together flour, baking powder, baking soda. 3. In a large bowl combine eggs and sugar; beat until thickened. Add banana; beat until well mixed. 4. Stir in flour mixture into egg mixture. Spread batter evenly into prepared pan, easing it carefully to the corners with a spatula. 5. Bake in preheated 375 degree oven for 13 to 15 minutes or until center springs back when lightly touched. 6. Immediately loosen cake from edges of pan; invert cake onto the prepared towel. Remove pan; carefully peel off paper. Roll up cake in towel while hot, starting with 10-inch side. Cool completely on wire rack (will take at least an hour). 7. When cake is almost completely cooled, make the filling: beat cream cheese, powdered sugar, butter and vanilla extract in small mixer bowl until smooth. 8. When cake has cooled completely, unroll and spread with filling (or your favorite cream cheese frosting) then re-roll cake. Wrap rolled cake in plastic wrap then refrigerate at least one hour (overnight is best). 9. When ready to serve, unwrap cake and place on a platter. Sprinkle with powdered sugar if desired (sift the sugar through a small mesh strainer for a nice presentation). Cut into slices. Aaahh, I've had many different flavored cake rolls, but never banana!! This sounds wonderful! Nicole, this looks and sounds delicious! I love the idea of the cream cheese filling. I must try this some time! BTW, beautiful picture! I make a fool-proof banana bread from an old Betty Crocker cookbook. My husband's office mates love and devour it. They would flip over a banana roll..thanks for the recipe. Personally, I feel you're focusing on the wrong part of this... The banana bread, roll, doorstop, whatever, is at most secondary... The star of this post is the cream cheese filling! The baked whatever is simply used as a transport mechanism to get cream cheese icing into the mouth! Sounds great, I'm going to try this tonight, I might make 2 and instead of cream cheese in one I'm going to use Nutella.....you can never get enough chocolate, especially with bannanas! Deborah: I really can't believe that it took me so long to think of this, it's the perfect combination! Jennifer: The cream cheese is the best part! Piealamona: You're welcome! And I agree, this is perfect to send to the office! Curt: I know, I really didn't talk enough about the cream cheese! In fact, the whole reason I dreamed this up was because I had extra cream cheese frosting leftover from the Red Velvet Cake I made recently. I couldn't let the frosting go to waste and I can only eat so much by the spoonful starting to feel sick! I was going to make some banana muffins and frost them but some friends and I were talking about Pumpkin Roll the other night and the next day a lightbulb went off! Mike: I think Nutella would be AWESOME in this! What a great idea! Sounds delicious, I was think to make banana bread sometime in weekend. I can try this .. I will let u know once I try. mmmmmmmmmmmmmmmmm! I love this idea, your so creative! :) Almost time to start making pumpkin rolls, I'll have to do half of them pumpkin style the other half banana! Thanks! Nice photo! Both the pumpkin and the banana sponge cake rolls sound good. this is a wonderful idea! A banana swiss roll! I would love to have that! What a wonderful invention! And thank you for mentioning my recipe! When I saw your pumpkin roll way back when I knew I wanted to make it but never got around to it, now I'll have to choose between banana and pumpkin... they both sound great! Hey, this reminds me of Flo Braker's recipe... She didn't have enough indulgence though to fill it with cream cheese! (Is that what they call a Bee-Sting cake (er, roll)?) I love the combination. I always end up making banana bread for my family because that's all they ask for with old bananas. Now I will have to introduce this recipe and see if it's as big of a hit. Sara: Three euros a slice! Ouch! We don't have any American bakeries down here except for one I know of on the other side of the island. But we do have our American grocery store on base so I can buy ingredients for just about anything I crave. But with all the yummy pasticcerie around, I don't miss American bakeries too much :-) Brilynn: Why not make one of each? :-) Manggy: I saw that recipe when I was trying to figure out who else was making banana rolls. Her cake is a butter cake rather than sponge and even though she says it can be rolled, I'm still be a little nervous to try it! But since I actually like butter cake better than sponge cake, I think I will try it sometime. I was thinking that her version would be especially good with the Nutella filling that Kevin mentioned! Carla: I usually do the same thing. About as adventurous as I ever used to get with ripe bananas was making banana muffins instead of a loaf of banana bread! It was fun to try something new although my banana muffins are much healthier than this cake! Ah I wish I can have a bite on that~! MMMM!! Looks fantastic. Thanks for a new banana idea. I just made a pumpkin cake/bar recipe that called for cream cheese icing, and I put just a pinch each of cinnamon and nutmeg in the icing, and it was delicious. I bet that would work really well with this recipe too. I love banana bread and am definitely going to try this. Makes for a great presentation too dosen't it? Oh that looks excellent! I'm going to have to go and buy some bananas now. I adore bananas but tend to buy them in a big bunch which often means I have a few which get really ripe before I can eat them. I love mixing them mashed into cake batter - it's a great way of using them, so I'll be giving this recipe a try too! What a good invention! I've never seen a recipe for a banana roll before and I have no idea why -- it's a sensational idea. I also like the OP's idea of a nutella filling too. Tish Boyle has a recipe for a banana walnut cake that's served with a caramel mascarpone whipped cream which I think would be another great filling for this. Also, thanks for the link to my blog. Oh, this looks lovely! I'm already thinking of ways to veganize it. What a beautiful photo and presentation. Wow does this look good! And it's perfect for our house. My husband is a fiend for carrot cake (primarily for the frosting) and we always have overripe bananas around because of our daughter. I'll most CERTAINLY be trying this out. Thanks! o my god that looks amazing. such a good idea. and something me and my son could make (and eat) together. thanks! This sounds like a very yummy twist on Banana bread. Lucky me has a bunch of over-ripe bananas in my kitchen! This recipe looks amazing, another one that I'll need to try out :-) Thank You! How do you roll a hot cake without it cracking? Recipe sounds wonderful, but that one instruction had me wondering. Add walnuts to the filling 10 times better. Candy: This cake actually rolls surprisingly well! It's a sponge cake and they are more pliable than butter cakes. Also it's really thin! Rolling it while warm and letting it cool in the towel makes it easier to roll back up again after filling it. It really does work! Tony: I tried it with walnuts and it was really good! What a great idea! I love banana bread, but this is a fun way to spiff things up. I made a banana bread this week using coconut oil and it was so fragrant and delicious. I'll have to try out your method sometime. Thanks for the inspiration! i still love bannana bread, but i gotta tell you ..that looks super tastey. i'm gonna try this . thnx. This is an amazing recipe ! I've done it over and over and its easily adaptable, esp for extra healthy! and super simple I just pick a blend of types of flours [soy & wheat] and use spenda baking blend instead of sugar, egg whites, and for the spread i use fat free cream cheese, use applesauce instead of butter, add some cinnamon and it's 105% amazing Thanks so much for this recipe! Your website is wonderful :) and I really admire you ! Now, that looks amazingly good. Would love to give that recipe a try! This dish got rave reviews from everyone! Absolutely delicious! This is absolutely delicious! Tried and tested recipe with raving reviews. I cooked them something to rave about for sure! I'm always looking for ways to use up bananas. I usually freeze them until I'm in the mood for another loaf of Banana Bread. This is a great idea! I just made a pumpkin roll a couple weeks ago, I'm going to give this a try with some of those frozen bananas. Thanks! Do I have to use parchment paper or Wax paper?? I have everything else to make this beautiful banana roll but the paper.. Thanks!! I have been making and selling banana rolls and pumpkin rolls for years.. The only difference is I add pineapple to my filling. It is to die for. I got the idea from my parents 50th anniversary cake, it was a banana cake with pineapple filling. I loved the combo so much I tried it with the roll and it was an instant hit. Now I sell more banana rolls than pumpkin rolls. Enjoy!!! I love doing cake rolls, so much fun. This goes on my To Do list too! I could never tire of banana bread either! This is a cute idea, like a braso de reina. This sounds incredible! Though I do not like bananas on their own, I love them in breads. This is on the list to make. Thanks! Hmm I agree, I don't think I could ever get sick of banana bread either, but yum, this looks so delicious. can't wait to make it. Thanks for the recipe. Nice twist on an old favorite - will have to bookmark and try your recipe - looks fantastic as well! Good job! Oh my god was this good! I have been looking for a new recipe to use up overripe bananas and this one turned out delicious! My husband absolutely loved it! Will be making this again for the holidays! I never fooled with this type of recipe because i thought i would screw it up but this one is foolproof! Thank You so much for posting this recipe! OMG I'm soooo happy right now! I wanted to make a banana roll and i have a recipe that i got from somewhere-maybe BHG recipe book, but the cream cheese filling was not that great. I have a recipe for pumpkin roll and thought of trying to combine that cream cheese filling with the banana roll cake recipe and then had a second thought to just switch the bananas for the pumpkin in the pumpkin roll recipe. but i was afraid to just try it so i went on a search to find another banana roll recipe and lo & behold I found this! Thank you sooo much for having the guts to just try it out!and letting the rest of us know it went well! where do you add the salt????????????????????? Oh wow! I think I will love this roll! I made a pumpkin roll last year and loved it. This looks like a keeper. I am saving this recipe. Thank you! Different, better, will give it a try! I donât usually reply to posts but I will in this case, great infoâ¦I will bookmark your site. Keep up the good work! This is a great recipe! I just made it. One thing I noticed though is that in the directions you do not mention to mix in the 1/4 tsp of salt listed in the ingredients. Just a heads up that you forgot that little piece of information! It turned out great though anyway! Thanks. I noticed you didn't include butter on your ingredients for the cake? does it really work without butter? This turned out great, I just made it after dinner tonight. No problems with it sticking to the towel, which was what I was worried about. Instead of butter for the filling I substituted a few tablespoons of peanut butter and it was really good. It looks delicious. Thanks for the share.